As promised, here’s another installment of my painting progress. I was only able to work on my piece for a short time yesterday, so there isn’t an astounding amount of progress to show but that’s better than nothing! Step Seven: Applying a colour wash. I like to do an acrylic colour wash over the drawing. I find it helps seal in the graphite and prevents the graphite from mucking up the paint. The graphite will add a grayish tone to any colour that you apply over it, which clearly isn’t a good thing. Using watered down acrylic paint makes the drying time between application and moving on to using oils practically nonexistent. I choose the predominant colour that you see in the reference. 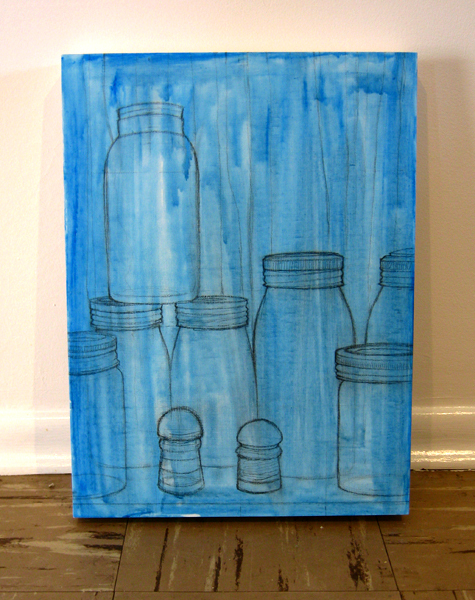 It’s mostly the undertones that I want to focus on so for this particular painting I decided to go with a cool blue. Step Eight: Painting with oils. This is where the fun really begins. Sure I really enjoy the drawing part but this is where colour makes it’s mark. When I start to paint I determine which area is the most logical to start working on. For this painting I figured the window sill would be the best place to start. Why? It automatically grounds the painting and establishes the darkest areas. This is important because this painting is all about the relationship between dark and light. The in between areas, the areas that are neither too light or too dark, will need the most finessing to get “right”. I look forward to tackling this task. 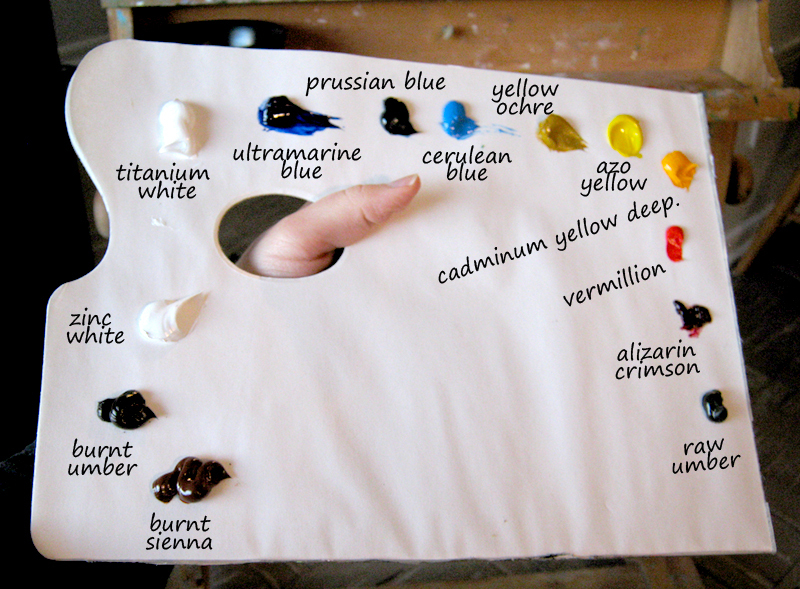 FYI: Here is a photo of my fresh palette. I’ve labeled the colours. There is a warm and cool representation of each colour on the palette. I’ve decided that for this painting I want the really dark areas to be warm and the light areas to be cool. I will be using Ultramarine Blue as the warm blue. 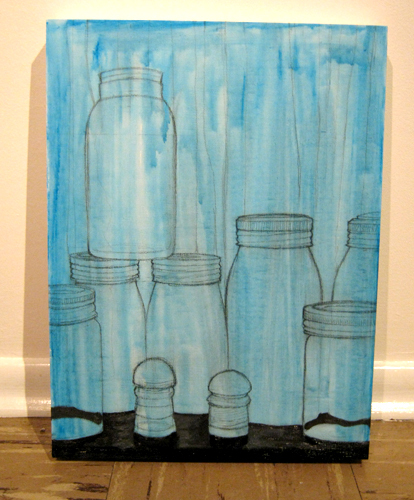 For the cool blues I will be using Prussian Blue and Cerulean Blue. The light areas will have traces of Azo Yellow with Cadmium Yellow Deep in the shadowed folds. So very excited about this warm/cool contrast! Tomorrow I will post my progress from today! I think I might tackle the jar lids next!